Part 2 - Rosa multiflora : no longer a good thing. Fig. 1 A large, healthy beautiful fragrant bush of 'R. Multiflora' Fig. 2 Blooms of 'R. multiflora' Fig. 3 RRD infected Multiflora setting seeds at Clifty Falls. 'Rosa multiflora' is a wild species rose native to east Asia. It was brought into this country in the early 1800's, and it has served us well. It is an excellent rootstock and has been used in breeding many of our highly prized garden roses. Some people think 'R. multiflora' spread throughout the country from rootstock gone wild. Thats not true. From the 1930's though the 1960's 'R. multiflora' was touted as a wonderful thing by the USDA and state agriculture departments. It was a good form of erosion control, a bird sanctuary, bird food, a wind break, used for strip mine reclamation and some highway departments even used it as a crash barrier. One of the main uses pushed by the USDA was as a living fence for cattle, hogs and horses. Why, you ask, would you need a living fence? On our farm, one can find many generations of old rusted fences on a walk through the woods - often when you dont want to. Rusted barbed wire and hog fence embedded in trees or partly buried catch blades of farm implements as well as feet of hikers farmers and livestock. Getting rid of them was a good idea. R. multiflora was also much cheaper than wire fence. The USDA and state extension offices promoted multiflora to the extent that they even paid farmers to plant it1. Like so many good ideas, this one had unintended consequences. The unintended consequence in this case was that a healthy mature bush can put out up to half a million seeds2 which are widely spread by birds. It likes our climate so much that it has been declared a noxious weed in several states. First warnings of this flaw arose in the 50's although states continued to sell the plants well into the 70's3. Early literature describes rose rosette disease (RRD) as a threat to all roses, as a disease that could and should be eradicated and 'R. 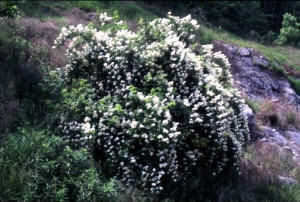 multiflora' was rated as less susceptible to RRD than several native rose species4. By coincidence, as grant money came available to study control of 'R. multiflora', RRD was portrayed as a good thing and multiflora as almost its sole victim5. Farmers dont want to admit that they are overgrazing6 or neglecting their fields, so multiflora is a convenient scape goat. One RRD proponent writing in the American Rose (Feb.1992) even tried to convince rose growers that the incredibly disease resistant7 R. multiflora is a threat to ornamental roses as a reservoir of potential disease8 (other than RRD) and that RRD posed little threat to ornamental roses9. Both assertions were simple not true. The irony is that there are dozens of other plant species that fill the same nitch in the environment. In our area privet hedge is far worse. Removal of all 'R. multiflora' would accomplish nothing. Roses in the wild are perfect hosts for rose rosette disease. Growing along fence lines, embankments and road rights of ways they put down roots. Livestock, road crews, and routine fence line clean outs separate the plant into many plants, no longer interconnected. The infection of one plant may lead to the infection of others, but at different stages of contagion. There may continue to be healthy looking plants with big leaves masking the contorted leaves of dying plants in the same area. This leads to the conclusion that RRD is not an effective weed control since you end up with a field of bushes at different levels of infection, but the same bushes may have canes healthy enough to set uninfected seeds (Fig. 3) and keep the lineage going. Multiflora seeds remain viable in the ground for 10 to 20 years10 so in our area it is not uncommon to see a new bush coming up in the same spot where a parent died from RRD. Up north, winter kill off of weakened plants is relied upon to justify its use as a weed control. Instead of a field of healthy bushes, we get ugly bushes in varying stages of infection, but they are never completely be gone. The Ohio Agriculture Department as much as admits in Bulletin 85711, that RRD doesnt work when it states;  Any successful multiflora rose control program requires yearly retreatment [with herbicides] or proper grazing management. Unless the landowner is willing to adopt a long-range program, any success achieved in one year will be largely negated by reinfestation in two or three years. A landowner willing to take care of his land wont have the problem in the first place. Poorly conceived research into RRD as a weed control has, no doubt, promoted the spread of this problem. In East Tennessee 'R. multiflora' is not the problem, its simply a symptom of uneconomic farming and farmland bought by and neglected by speculators on the outskirts of cities. Well tended fields wouldnt have the problem in the first place. Originally, I had hoped RRD was like a forest fire that will pass through an area doing its damage, but allowing one to replant in its wake. I have come to realize it is more like a slow burn that will stay with us forever as a continuing source of infection via mites that could ultimately become resistant to our limited arsenal of miticide. As rose growers we simply have to learn to live with it as we have learned to live with Japanese beetles or black spot. # 3. Crowe, F.J., 1983, Witches= Broom of Rose: A New Outbreak in Several Central States,Plant Disease, Vol.67 No.5. # 4. Thomas, E.A., Scott, C.E., 1953. Rosette of Rose. Phytopathology 43: 218-219. # 5. Hill, J.H. & Epstein, A.H., Double Stranded RNA Associated with Rose Rosette Disease of Multiflora Rose, 1990, Plant Disease, Vol. 74 No. 1. # 6. Hartzler, R.G. & Owen, D.K., 1992. 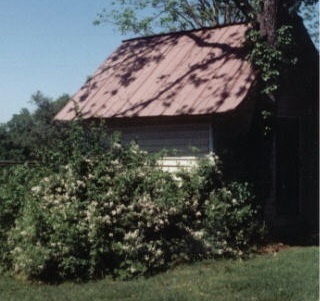 Multiflora Rose and Its Control, March 1992 Iowa State University Ext. Pm- 863. # 7. Hindal, D.F. & Sek Man Wong, 1988, Potential Biocontrol of Multiflora Rose, Weed Technology Vol 2:122, p.124-125. # 8. Epstein, A.H., and Hill, J.H.,1998, American Rose, Progress Report - Rose Rosette Disease (2):16. # 9. Epstein, A.H., 1992, Rose Rosette Disease:An All-American Malady of Rose. American Rose (2):24-25. #10 . 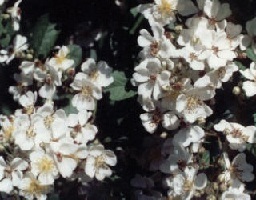 ----, Multiflora Rose,TN-EPPC Manual,http://webriver.com/tn- eppc/manual/rosa.htm&_wsgettop393b0975e0fec4b_00. #11 . Underwood, J.F., Loux, M.M., Armine, J.W. Jr., Bryan, W.B.1996, Multiflora Rose Control, Ohio State University, Follow up Maintenance p.1. Fig. 1 The Rosa multiflora we took out. The prevailing wind direction is from the far side of the shed. Fig. 1b The very distinctive leaf of healthy 'R. multiflora'. Nine or sometimes seven leaflets per leaf and the hairy stipule at the base of the leaf is a key to identification in addition to the large arching growth habit of the canes. 'Rosa multiflora', a common rose in the eastern United States, may host Rose Rosette Disease (RRD). In innocence and with government encouragement, man planted millions of bushes of R. multiflora. They, in return, produced hips with seeds easily dispersed by birds and spread by natural tip layering as well as by runners, turning small rose bushes into gigantic masses. RRD spreads from one rose to others. In the R. 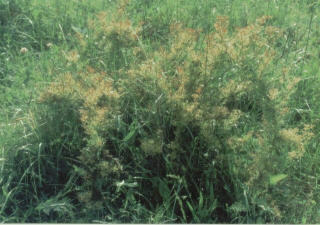 multiflora population, most bushes in a field become infected after one is infected. From wild roses, RRD spreads to cultivated roses. This disease remains relatively unknown and unrecognized both in wild R. multiflora and in cultivated roses. 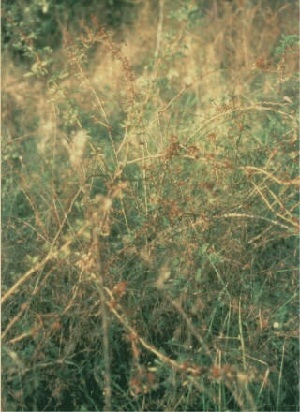 (Chapter 2 describes symptoms on cultivated roses. This chapter addresses the disease on wild R.multiflora.) Many how-to rose books do not even mention RRD, much less illustrate it. Recognition of different stages of RRD infection on wild R. multiflora will help rose growers assess this danger to their gardens. Rosa multiflora' used to be a wonderful sign of spring: masses of white flowers filling the air with soft fragrance. Hillsides over looked most of the year demand attention for their cascading blooms that gleam in clear spring light. Seven years ago I was delighted to find a small volunteer rose bush in our yard. The next year it bloomed and was easily identified as R. multiflora. Year three it grew vigorously, and in 1999 it was magnificent (Fig. 1). The mass of fragrant white blooms nestled in dense light green foliage rendered any insect or fungal problems insignificant. 'R. multiflora hasnt been a particularly bad neighbor, a bit too aggressive in good years, but generally it grows without care filling abandoned fields. Bushhogging or proper grazing will keep it in check. It will, however, come back when the fields are not tended. In areas where there is intensive farming, where ever acre counts, many people consider R. multiflora an enemy. In the Valley and Ridge of east Tennessee, it hasnt been that unwelcome an old field invader because no one cared what happened to many fields where farming became uneconomical. Then we started living with rose rosette. Now R. multiflora is unwanted. 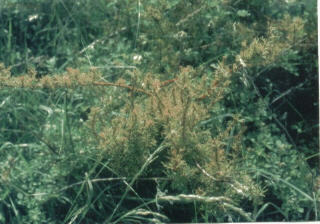 If a bush isnt infected with RRD now, it may be next week, next month or next year. Infected stems are hidden by newer growth, and once distorted stems and canes are clearly visible, the infection may have spread to roses downwind. Three months after we started recording the spread of RRD in Harrogate TN (30.6 miles, 49.3 km, from our farm), we found over an acre of R. multiflora, severely infected with advanced stages of RRD in Union County, 10.6 miles (17 km) from and upwind of our roses. There are many thousands of R. multiflora in fields, forests and along hedgerows between our roses and that hillside. We decided to remove our volunteer plant because we could no longer see its base, nor could we see many canes at its center. We felt vulnerable to the possibility of growing a bush with RRD and not even knowing it. I had hoped to enjoy one last spring with this big fragrant bush, but my husband, Larry, chopped, dug and then burned the bush. As usual, new growth emerged from the few roots he had left behind. We talked about digging the roots up to save and use as rootstock to learn grafting, but the weather turned dry and inaction was easier. Friday, September 15, nineteen days after any rainfall, the ground was so dry that you could stick a pencil into the cracks in our clay soil. There, on the ground, was new growth on a stem of R. multiflora. Other root sourced R. multiflora two feet away showed no signs of new growth. This one bush had 6-8-inch stems emerging from every bud axil at a time when there was NO reason for aggressive growth to have commenced. (Here is where the "excessive and unexpected" parts of the RRD adjectives come in. There was NO reason for that growth.) The bronze color that we had first seen on infected stems was there, in our yard, near our other roses. So we dug it up, all of it, immediately, and bagged it. We refrigerated the canes for later delivery to experts for confirmation of the RRD diagnosis we anticipated. (We are fortunate to have the University of Tennessee College of Agriculture as well as offices of the Cooperative Extension Service nearby in Knoxville. Elsewhere we would have gone through a (hopefully) understanding County Extension Agent). We waited. Not knowing for sure was hard; we were relieved that we had removed the big bush when we had. We walked our fencelines to check out another R. multiflora plant that showed NO new growth and looked normal. On October 9 UT confirmed rose rosette on that vigorous growth from our back yard. What comes with RRD confirmation is a real mixture of feelings: relief that we had acted agresssively when we realized that RRD was closer than we expected, relief that we had caught its very first growth spurt, and horror that other infection-bearing mites might have floated to other roses on the same winds. R. multiflora is supposed to be extremely susceptible to RRD, more so than many other roses. That we recognized the threat of having multiflora in the yard was the first step in protecting our roses . We did realize that there was no way to watch for new growth on a wonderfully tangled mass of roses that housed bird nests and praying mantis. So we dug it out prematurely. But our action quickly proved to be the right one. Perhaps we should keep a small R. multiflora to use as a canary bird so we know when to be especially vigilant about RRD infection, but we have enough roses with R. multiflora in their parentage. Well just watch them more closely and prune to prevent obscured centers. Lesson learned: decide before hand what actions you will or should take when you find you live in an area with bushes infected with rose rosette. Rosa multiflora is now common east of the Rockies because it was planted to fill a variety of niches. Imported from the far east, R. multiflora has been used as an understock, as a soil stabilizer, as a goverment endorsed substitute for barbed wire, as cover for wildlife (avian and other), as a wind break to slow erosion, to aid in strip mine reclamation and as a parent for hardy climbing roses. It has served us well. If anything, it succeeded too well, and became first a plant officially classified as pest, and then more sternly, a noxious weed, by proclamation of several state legislatures. like to eat. Its name, other than rose hedge, is Rosa Multiflora. task, I shudder to think of it. I wish Gramps had just let the kids have the watermelons. New Jersey was one of many states to benefit from such plantings. Likewise multiflora was used in Nebraska for mass plantings. A two mile long fence of R. multiflora planted near the State Fish Hatchery near North Platte NB was infected with witches broom before 1961 (Viehmeyer 1961, p98). A retired farm manager from near Nashville TN told me about ordering 9000 whips of multiflora to grow a hedge and receiving 90,000; he planted all of them south of Nashville. He said that the mature fence could stop boar hogs running at full speed. In his retirement years in east Tennessee, his personal rose garden suffered from an initial twenty percent loss to RRD. The first sign of infection on R. 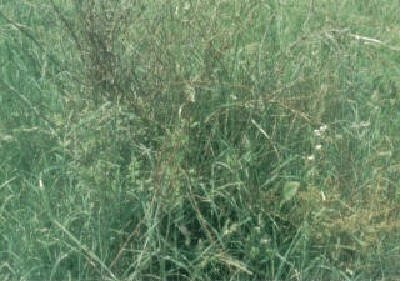 multiflora is irregular growth at or near the initial site of infection. (Fig. 2) This rose is downwind of a large field filled with severely infected mature bushes of R multiflora. It first showed infection in early fall 2000, on this cane where there is excessive growth from the axial buds near the end of the cane. Within four weeks the weight of vigorous RRD-caused growth at the end of the cane, bent the enlarged cane downward, and weeds started to grow over the bent over and infected cane. Roses that have been infected longer show additional symptoms of RRD. Larry searched the field above the rose garden at LMU to check for signs of RRD. In the field he recognized and photographed three stages of RRD infection on mature R. multiflora. Infection progresses as the viroids move down the stem, and leaf axil after leaf axil grow masses of foliage- witches brooms- along the cane. These tufts of denser growth stand out because they are different from normal growth. Where a single bud axil would produce a leaf, multiple leaves and or stems emerge. The color of the new growth varies, but is seldom the green of that rose when it's healthy. Colors vary from pink to red to bronze tinted. Other (not yet infected) canes on the same bush may show no new growth, or growth that is normal. I havent seen excessive thorns on RRD infected R. multifora although others have illustrated hyperthorny canes. In spring,I havent observed blooms on infected canes (Fig. 3). I have seen mature seeds that may have formed before their canes were infected on bushes with infected canes. axils. Each stem is a mass of distorted leaves. Growth continues and abnormalities increase. Most canes have distorted foliage and the canes themselves may twist as they grow. Many nodes have multiple stems emerging. (Fig. 4). Excessive cane death occurs. Most R. multiflora is vigorous and a heathy bush has few dead canes. A mature stand of RRD infected R. multiflora is predominantly dead canes, many twisted and contorted. The RRD-dead canes are black, not gray or brown. We have never seen a totally dead 'R. multiflora ; one or two canes appear to survive, and there is new growth near the soil, whether from self sown seeds or from roots putting up new canes. (Fig. 5). RRD doesnt eradicate 'R.multiflora' in an area. Amrine et al. reported observations of Rose Rosette as a biocontrol of Multiflora Rose, 1987-1989". Their study at Clifty Falls State Park in Madison Indiana concluded: We believe that all RRD-infected mulflora roses eventually were killed by the disease and that resistance to RRD in multiflora rose is lacking. We predict the present 86.9% infection rate will result in 86.9% mortality in the next two years at Madison ..... To sum up our 3 seasons research at Madison, Indiana. Rosa multiflora (an introduced weed) will be greatly affected by the rapid spread of both the vector mite and RRD, both native to N. America). We expect the majority of multiflora roses in the eastern United States to become infected by RRD in the course of the next 10 to 20 years." Fig. 5. 'R. multiflora' with many black, contorted, dead canes. New growth emerges at lower right and lower left. Figure 6. Clifty Falls State Park. Madison Indiana.RRD infected 'R. multiflora' just off the eastern road. This plant had been browsed by the local deer herd that doubtless welcomed succulent new, albeit distorted, growth in late fall. Abundant seeds indicated that this plant had bloomed in Spring 2000. Because we had seen a lot of sick roses in east Tennessee, but NO totally dead clumps, we drove to Clifty Falls in November 2000. There is still R. multiflora throughout the park.(Fig. 6) The total number of bushes may have declined, but there are no longer open fields and R. multiflora is an open field invader at its worst and most agressive. Much of the R. multiflora there is sick, but there are still blooms and seeds. The infection has NOT moved through, but survives in the wild stands of infected R. multiflora twelve years later. 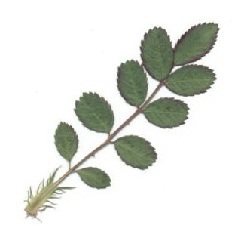 As long as Rosa multiflora persists in abandoned fields, it remains vulnerable to infection by the airborne mites that transmit Rose Rosette Disease, and these plants have the potential to pass the disease along to roses down wind, in the next garden, the next farm, the next county, the next state. Amrine, J.W., Hindal, D.F., Appel, J, Stasny, T. and Kasser, A. 1989, Rose Rosette as Biocontrol of Multiflora Rose 1987-1989.Proceedings Southern Weed Sci. Soc. 43:316-319. Viehmeyer, G. 1962, A New Disease of Roses. American Rose Annual: 98-101.
two years to kill 99 percent of the bush, and even then it will require some harsh weather to help get that done. droppings of the birds that eat the hips. died outright in the summer dry period. This disease is devastating to the briars, but there are new stands of briars starting in other places on the farm. Most of these are in areas where the land was tilled this spring for planting flood plots. None of these stands shows the disease at all this fall. This would suggest that either through birds, seed included in the planting mixes, or healthy seed that was buried and revealed by the tilling, that the briars will easily be able to repopulate once the infected multiflora is gone. If that ever happens. there was no source of healthy seed, but I know of no such place. The briar crop would seem to be able to absorb the effects of the disease with maybe the loss of a few years production, but it will repopulate the area as long as there are healthy plants in the area. From my observations, the effects of RRD on a large commercial stand of briar plants would be devatating, but again, it would be a limited one to two year problem if the source of the infection could be eliminated. I collected hips from some of the older rugosa type roses growing on the farm. One of the bushes was later observed to be showing RRD on the other side of the fence where I could not see it. I will be growing seedlings from those hips this year, and will report back on whether or not any of the seedlings show the disease inside under the lights before being moved outside in the spring. One would hope that the disease, if passed by seed, would stop those seeds from being viable or kill those seedlings very quickly. If seedlings so sprout and grow with the disease for a time period, then things get complicated. This would suggest that the disease is completely useless as a control for anything, as sonner or later a seedling would develope that is immune to the effect of the disease, but most likely still a posible host plant. If this is the case, RRD is forever.